In 1960 the United Nations adopted resolution 1514 which stated that all people have a right to self-determination and that colonialism should be brought to a speedy and unconditional end. Half-a-century later it may come as a surprise to readers to learn that there are still 16 territories around the world that have yet to achieve decolononisation. Known as “non-self-governing territories” the list of places still ruled by a foreign power contains some familiar names: Gibraltar and the Falkland Islands (Malvinas) to name just two. But while some of these territories, like the tiny Pacific Island of Tokelau, are dependencies that could be said to have rejected independence and democratically chosen to maintain their territorial status, others are more controversial. Most notable is Western Sahara, known as Africa’s last colony, which has fought for self-determination for more than 35 years against neighbouring Morocco. In New York the UN’s Fourth Committee on Decolonisation heard petitions from people speaking on behalf of these non-self governing territories. As on previous occasions, this year’s meeting was dominated by petitions on the conflict in Western Sahara. 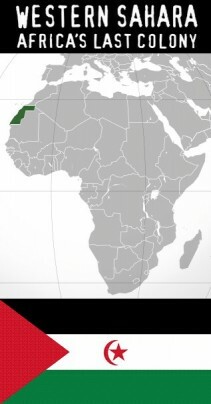 About the size of Britain, Western Sahara lies along Africa’s Atlantic coast. In 1976, in a breach of international law, the departing Spanish divided Western Sahara between Morocco and Mauritania in exchange for continued fishing rights and partial ownership of mining interests. A 15-year war ensued between the Moroccans and the Polisario Front, with the Mauritanians withdrawing in 1979. In 1991 a cease-fire was declared and, under the terms of a UN agreement, a referendum for self-determination was promised. Nineteen years later the native Saharawi are still awaiting that referendum. 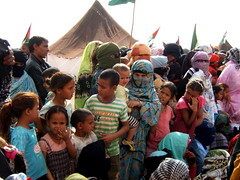 An estimated 165 000 Saharawi refugees who fled the fighting are still housed in desolate camps in the Algerian desert. Despite aid from the UN, conditions in the camps are abject, with widespread health problems including hepatitis B, anaemia and meningitis. A 2008 survey by the World Health Organisation said one in five children in the camps suffered from acute malnutrition. 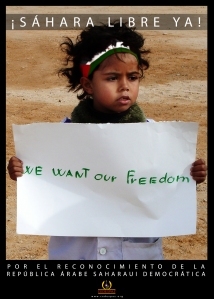 Within occupied Western Sahara, the Saharawi population faces discrimination and human rights abuses. 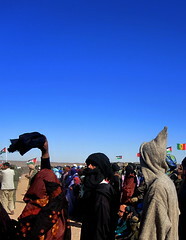 International organisations, including the UN High Commissioner for Human Rights, have raised serious concerns about violations of human rights in the territory and a 2008 report by Human Rights Watch found that Morocco had violated the rights to expression, association and assembly in Western Sahara. Recently the first anniversary of the arrest of several prominent human rights defenders at Casablanca airport after they returned from a visit to the refugee camps was commemorated. Three of the activists — Brahim Dahane, Ali Salem Tamek and Ahmed Naciri — were accused of treason, a charge punishable by death. Their trial is expected to start in late October. Against the backdrop of this human tragedy, the European Union has concluded a fisheries agreement with Morocco under which Western Saharan waters are being unlawfully exploited by European fishing vessels. Many foreign governments and companies are involved in deals with Morocco, which give them access to Western Sahara’s vast mineral resources, most notably phosphates. In New York recently the UN Fourth Committee heard more than 80 petitions on the subject of Western Sahara, including an impassioned plea from Suzanne Scholte, the president of the Defence Forum Foundation. “Do not let the [Saharawi people’s] trust in this committee be in vain or you will send a terrible signal to the world that invasion, aggression and violence, as Morocco has employed, are the ways to achieve your ends,” she said. Despite many attempts to break the long-running diplomatic stalemate, progress towards a resolution has been tortuously slow. A political solution may seem far off with the parties’ positions being so far apart: the Polisario Front is unprepared to negotiate away its legitimate right to self-determination; Morocco rejects any proposal that contains even the possibility of independence; and the UN Security Council is, so far, unwilling to enforce its own resolutions. But history has shown that a political solution is the only way forward. Such a solution is too important to be left in the hands of politicians, however. It is up to civil society groups, campaigners and individuals to make their voices heard and call on their governments to exert diplomatic and political pressure on those who are ignoring the requirements laid out under international law. There is little doubt that the people of Western Sahara have the tide of history and the force of justice on their side. more about the plight of a people ousted from their land. I flew out of New York’s stone desert and into a real one. 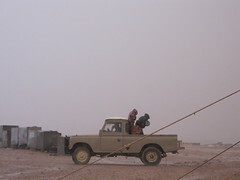 Our journey was to begin in the Tindouf refugee camps in the Algerian desert, inhabited by some 165,000 forgotten people, the Saharawi, for over 30 years. The mineral-rich region of Western Sahara, on the northwest coast of Africa between Morocco and Mauritania, was occupied by Morocco (and initially, by Mauritania) after the Spanish, her original colonizers, left. 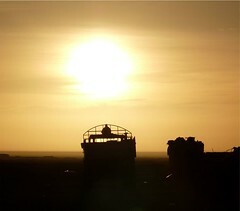 Despite the International Court of Justice’s ruling in 1975 that Western Sahara should not be immune to the rules of decolonization, no other country has stood up to Morocco or tried to make her back out of Western Sahara, or even denounced the construction of a 1500- kilometre fortified wall. No one talks about a wall that divides every Saharawi refugee family from their relatives and friends in the occupied parts of Western Sahara. Furthermore, this wall, known as the berm, is estimated to harbor up to 5 million landmines. The territory as a whole is littered with unexploded ordinance posing a serious threat to those Saharawi nomads who still survive by roaming the territory with their herds. Landmine Action which is trying to implement a demining program, considers the territory to be one of the top ten most heavily mined areas in the world. Like many good stories, this one begins in jail. Piera’s uncle was rescued from a prison in Algeria by the Polisario Front, the Saharawi liberation movement. I sympathized with her uncle’s imprisonment as my father, Jonathan Aitken’s, well- known incarceration in a British jail was not his only time spent behind bars; he was also imprisoned in Africa for just one night during the Biafa war. Piera’s stories of her uncle inspired me. I was bored with the usual beach holiday and while a trip to a war zone in the Sahara might not be everyone’s idea of two weeks in the sun, it seemed like just the trip to get my adrenaline running. Before I went I was warned of poisonous vipers and scorpions, not to mention stories of people being detained without trial and tortured simply for displaying their own flag. You cannot complain to anyone if your flights, visas, transport, or food go wrong. Luckily, the only ‘click click’ I heard was women signaling yes—they clack their tongues to agree. After our plane landed, we drove from the airport and passed through several Algerian military checkpoints in order to reach our destination. We were greeted by our host, the President’s right-hand man and Chief Civil Servant, Lih Beiruk, dressed in daraa and buboo, and his beautiful wife, Tumana, dressed in a melhsa, who said a quick hello before we went to bed. I had also been warned of what sights to expect—of downtrodden refugees who have to live in camps with very little food, no education, unstable housing, and poor healthcare. Even more shockingly, aid to the area is decreasing every day. The only country that has stepped in to protect the Saharawi is Algeria. It’s like when Guatemala claimed Belize was really part of Guatemala, but before they could even begin invading, the Brits were there to keep Belize, Belize. What must be remembered is that the Saharawi are a peaceful people, who passionately love their country. While the conditions were as terrible as I expected them to be, what surprised me most was the positive spirit of the people, making the most of what little they have and refusing to resort to divisive tactics such as terrorism. Amongst the Saharawi, there is an unshakable solidarity and support of each other. I went to interview the head of the military, General Mohamed El-Waleed, who told me, like many others, that he was thrown into several secret prisons during the war for cutting the phosphate production line that the Moroccans had tried to hijack. 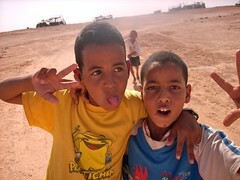 (The Moroccans now profit from all of Western Sahara’s phosphate mines, sharing none of the revenue with the Sahawaris. Western Sahara is one of the biggest phosphate producers in the world—it is used in detergents and fertilizers.) He went on to explain how, while in jail, the phosphate protectorates were given the chance to escape but they chose to remain behind with the other Saharawi prisoners as a sign of solidarity. Their belief is unshakeable. This solidarity was present throughout our visit. One day we attended a political rally, a highly illegal occurrence, and never in my life have I seen such passionate speeches, with people singing and flags waving, all in the cause to free Western Sahara. Unfortunately, none of these speeches ever reached Western countries via any kind of media—the editors of radio news programs and television news bulletins do not see the plight of Sahawaris as newsworthy enough. While there, we were told another jail story, this time from M’Barek Touill, who was thrown into a secret underground jail by the Moroccans. Touill was tortured and was to be executed. The only thing that saved him was the fact that he was married to an American woman—after befriending a prison guard, he managed to contact his wife, who had at this point assumed he was one of the many Saharawis missing without a trace in Morocco and presumed dead. Upon receiving a letter from him, she went about rescuing him. Sadly for others, his was only one story of escape amongst hundreds of stories of missing people, who are either still imprisoned or have been killed. Hot blood runs through their veins and it was like experiencing 1001 Nights all over again. Rumi, who is often on the radio as his poems are sung in Arabic songs, did not come from this part of the world for nothing. We arrived in the week of the Saharan Film Festival—an international film festival organized by the Spanish film community to highlight the plight of the Saharawis. Films being shown this year included films from India (Mai Hoon Na, a Hindu love story), from Argentina (Enlighted by the Fire), from Spain (Heroine). And the winner this year was a collaboration between Mongolia and Germany, The Story of the Weeping Camel, which won the first place prize of, ironically, an albino camel, which I’m sure did weep as the team of Mongolian and German filmmakers were unable to take their prize home with them. Instead, they gave the camel to a local for dinner. Camel was frequently on the menu; a bit chewy in stews, it tastes better when char grilled on skewers. In true nomadic style, the hospitality we experienced was five-star. The adage ‘your house is my house’ rang true everywhere we ate. Almost every night, like aspiring Nomads, we moved from one set of neighbors’ houses to another, sitting on rugs under the stars. But we didn’t have a chance to experience other local specialties, including gazelle and ostrich. The only drawback to experiencing such amazing levels of hospitality was having to travel back to our host’s house after each of these dinners. Crossing the Sahara’s dunes at night is nothing short of treacherous, especially when the jeeps don’t possess anything as glamorous as satellite navigation. We weren’t as fearless as our driver, Mohammed, whose toes had been blown off in the war, yet still managed to be an excellent driver. He’d served in the army and guided his way by looking at the stars. If we ever got lost during the daytime, he could tell our exact location just by picking up a handful of sand and by examining the grains. However, that sand is not always as fine as that depicted in Lawrence of Arabia movies—it’s sometimes very rocky, so traveling home after a hearty Nomadic dinner wasn’t particularly kind on my digestion. Speaking of driving, we also witnessed Tumana, our hostess, training to be a driving instructor. Trying to reverse a 4×4 up a sand dune and not get stuck is a whole new set of skills. Like all women, Tumana was modestly dressed and covered her head for religious reasons. I too covered up due to the intensity of the sun—it didn’t turn me golden but fried me. I am now covered in sunspots and am suffering from burned eyes. No wonder some of the women wear woolen gloves to protect their hands from the sun—the discomfort from the scratchy wool is far more bearable than the possibility of severe sunburn. And despite what assumptions you may make due to their religious attire, Sahawari women here are treated as equals and they tolerate all religions. There are no recorded acts of violence against women. Women can remarry, too. For example, the Minister of Culture has been married three times and her sister has been married seven times. And in marriage, it’s the men who pay the dowry. After bouncing through the desert, we were served hot tea. Hot tea in the desert? If you think that’s strange, well they have the hottest hamam there too. Tea is thought in the West to be good for an upset stomach, but here, due to one camel steak too many, I had to take a trip to a local herbalist for my problems. Before the War, you could see a fish doctor for your ailments, who would advise on what kind of fish diet would be best for your problems, but now that Morocco profits from all the fish on Western Sahara’s coastline, it’s no longer a possibility. And the local hospital was not a good option. The hospital is seriously hot. It was constructed by Europeans, not locals, so the air doesn’t circulate properly. Sadly, the European Union has recently voted in favor of a Fisheries Agreement that allows European boats to fish off the coast of this illegally occupied nation, despite claims from critics that it violates international law. We visited the land mine hospital, too, and saw the awful evidence of the damage that these despicable weapons cause. 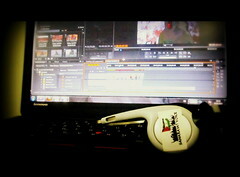 It broke my heart despite the victims being unbelievably upbeat. What I also found utterly depressing was the lack of equipment to treat these people. A tragedy in itself. In terms of retribution, some tell the story of a Saudi Prince—the Saudis support Morocco’s occupation—who came here to hunt the Saharawi’s beloved desert bird…and stepped on a landmine. He wasn’t injured, but it stopped him returning the following year. From what I saw and from the people I spoke to, there was only ever one conclusion I could reach: it’s time to let the refugees go home and give them back their country. Saharawis are not Moroccan. They never wanted to be Moroccan. They should not be forced by Morocco to become Moroccan. Even Medecins Sans Frontieres, the independent humanitarian medical aid agency, have colored Western Sahara the same color as Morocco on their website’s map. Morocco’s plans to assimilate Saharawi culture into their own have so far proved unsuccessful, resulting in Moroccans resorting to violent methods. 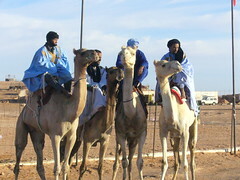 Saharawis speak a different language, are a different culture, and have different customs. Morocco has divided this people up, with loved-ones split from one another and whole new generations being born within the confines of the refugee camps. Luckily, there are telephones so relatives can still talk to each other. Back in London, I discovered this charity called Sandblast, which recently formed to draw attention to the plight of the Saharawis by promoting and strengthening their voices and visions through the arts. It is headed by Danielle Smith, who has been closely involved with the Saharawi community since 1991 and has continually visited the refugee camps. She is hoping to launch Sandblast with a 3- day, large scale festival in London, next year in May, and invite up to 18 Saharawi refugee artists to present a fascinating program of artistic events involving collaboration with different international and London-based artists. Her vision is to put the Saharawis on the map culturally and to challenge all our received notions of Islamic societies and refugee communities, to counter the pervasive view that relates terrorism with Islam. I feel encouraged that if these kind of initiatives are supported and are successful that we can all join in to strengthen that “signal” and communicate to the world about the Saharawi plight until we can see them return home.